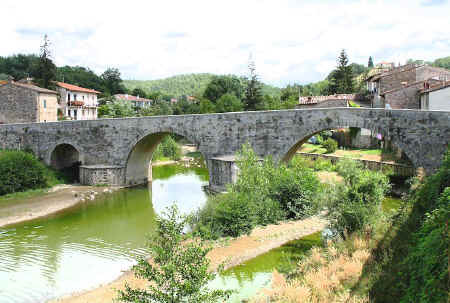 Ponte di Ramagliano, the mediaeval bridge over the river Pesa at Sambuca Val di Pesa. Emanuele Repetti in his Dizionario locates the village of Sambuca on the "left bank of the Pesa" and "at the head of the bridge, which is called Ramagliano". Historical documents regarding the Chianti village of Sambuca are few, but the castle of Romagliano, located here on the ancient Roman road, is mentioned in documents from 1053 and the earliest extant documents regarding the Sambuca bridge date to 1179. From an ecclesiastical point of view, Sambuca belonged to the parish of San Pietro in Bossolo. Thanks to its strategic and geographic location, particularly as a good crossing place over the River Pesa, Sambuca always managed to maintain a certain autonomy from the nearby castles of Semifonte and Barberino Val d' Elsa, but not from the Abbey of Passignano. In the territory of Sambuca there was a small church dedicated to San Jacopo and called "La Canonica". The church was located in position dominating the area near the Castle of Romagliano. It is mentioned twice in documents at the Abbey of Passignano, first 1166 ("actum in castro de Sambuca") and then in 1168 when the Abbot of Passignano bought "duo modiora et quattuor stariora terre que sunt in corte de Sambuco". In addition to these purchases, the same document refers to a further acquisition consisting of the piazza del Castello with the obligation to the tenant to build himself a house "et habitare in la semper". Further evidence dates from 1215, when the Abbot of Passignano ceded part of a house "in castro Sambuca". From the documents of the 12 C, it is noted that the Castle of Sambuca assumed considerable importance from its position at the intersection of the road leading from Florence to Sienna and then on to Rome and another road that led from the Chianti to the Val d' Elsa. The bridge of Romagliano, which still exists today and which carried the ancient Roman Via Regia over the River Pesa, already existed in the 12 C since it is mentioned in a document dated 29 October 1179. Subsequently, in June 1219 and 8 January 1295, in addition to the bridge, the existence of a "village of Ponte della Sambuca " is mentioned. Near the bridge even today there are buildings with architectural features dating from the 12 C and the 13 C. One of these buildings may have been used as a defense tower on the bridge and later was converted into a tavern, as is clear from the papers of the Capitani del Ponte. On 20 September 1301, Sambuca is mentioned in a document which states "a license was given by the Commune of Florence to two master masons to build houses in the village of Sambuca", indicating that the village was slowly developing. The same masons' license was confirmed on 5 January, 1302, and a number of houses were built along the two banks of the river Pesa, both upstream and downstream of the bridge Ramagliano. In 1415 the bridge was rebuilt and widened, paid for by a tax levied on the inhabitants of Sambuca and Tavarnelle by the Florentine Signoria. The bridge was strategically important enough to be drawn by Leonardo da Vinci on his map of Tuscany, now housed in the Royal Library at Windsor. An additional bridge over the Pesa, called the Ponte Nuovo, was built at the end of the 18 C and was constructed "two miles down the hill opposite the fabbrica" where the Via Cassia currently passes. The old Ramagliano bridge was enlarged in 1843 but damaged during the Second World War and rebuilt in 1946-1947. In common with other road and/or railway junctions that were severely bombed during the Second World War, such as Pontassieve and Poggibonsi, Sambuca developed as a light industrial area. Between 1953 and 1975 the new church in the centre of town was constructed and works of art from the old church were relocated here. Of particular interest are a small Gothic pietra serena tabernacle perhaps of the early 15 C Florentine school, and a Madonna with Saints by a late 18 C Florentine painter. Back to Val di Pesa. Copyright © ammonet InfoTech 2013 - 2018. All rights reserved.